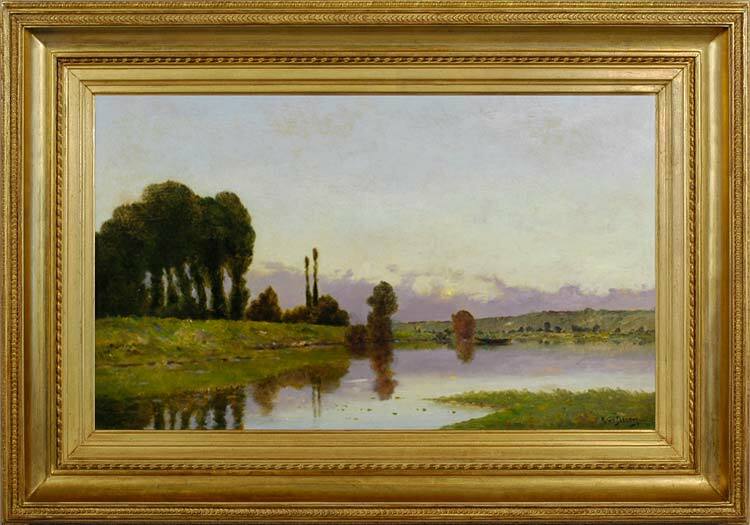 A characteristic view of the river Oise by Delpy, the low viewpoint, motionless water and suffusion of soft clear light all contribute to the mood of pastoral tranquillity. The unusually wide format relative to the height adds to a sense of the landscape opening out before the spectator in a romantic sweep of forest and water-meadow. This is a compositional tool of Charles-François Daubigny’s, which the younger Delpy must have learnt from his father. It is the viewpoint which the two elder painters would have taken from the deck of Daubigny’s boat, Le botin, and it may well be that the Delpys, father and son, later acquired their own boat for painting expeditions. Jacques-Henri Delpy was born in Bois-le-Roi (Seine-et-Marne) in 1877. His father, Hippolyte-Camille Delpy (1842-1910), was a very prolific artist; a landscapist and engraver, he was influenced by the Barbizon School and was a pupil of Daubigny (1817-78), with whom he enjoyed painting expeditions on the elder painter’s boat. However, he also knew Pissarro and Cézanne, and his work shows the influence of their brushwork and use of colour. He went on to exhibit at the Expo Universelle of 1900. His son, Jacques-Henri, was trained by his father; his work is mainly in the style of Daubigny with a slight impressionist flavour. Both father and son produced pictures of similar subjects and in the same idiom: serene and timeless idylls, illuminated by the sun of a golden age. However, Jacques-Henri also painted still life subjects in a much more modern idiom; for example, Poppies in a vase, where the areas of flat bold colour and graphic treatment are very different from his pastoral landscapes. He was elected a member of the Sociétaire du salon des Artistes Français; he exhibited in the Salon and with the Indépendants.